2014 Leaf Legends of the Links Golf puts a new spin on the traditional cut signature product. 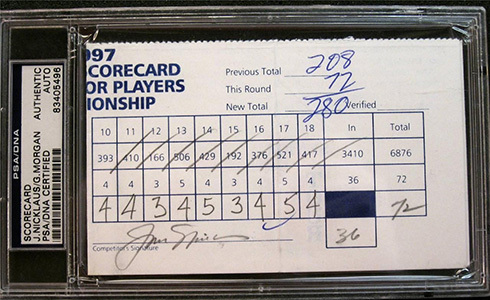 While every box still guarantees a regular cut autograph, there is also a signed scorecard used in a tournament. 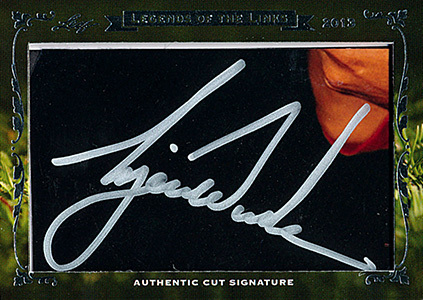 Cut signatures include both single- and dual-signed cards. Among the dual-autograph combinations are Jack Nicklaus and Tiger Woods, Byron Nelson and Nicklaus, and Woods and Vijay Singh. All cut signatures are slabbed by BGS. The autographed tournament-used scorecards bridge cards and signed memorabilia. Each is slabbed and authenticated by PSA. Among the players available in the product are Woods, Nicklaus, Arnold Palmer, Greg Norman, Payne Stewart and Phil Mickelson. 2014 Leaf Legends of the Links Golf has a limited print run of 165 cases. Each case has 12 boxes.